How many natural spas and health resorts does Slovenia have? Enter your email address and click "Participate". For more information about the Sweepstakes, please read the Rules. Awards: 4x wellness vacation for two persons in natural spas and health resorts in Slovenia! Rules of the Sweepstakes "Grande gioco a premi"
The organizer of the sweepstakes “Grande gioco a premi” is AV studio, Ltd., Koroška cesta 55, 3320 Velenje (hereinafter referred to as AV studio). The organizer is publishing the sweepstakes for the client Skupnost slovenskih naravnih zdravilišč, EEIG, Teharska cesta 40, 3000 Celje (hereinafter SSNZ) for advertising purposes. 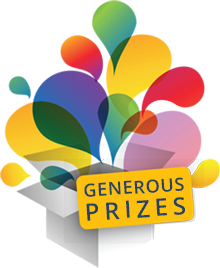 Sweepstakes runs from March 21, 2015 to October 31, 2015 with an online open form. There will be selected 4 winners out of correctly answered answers who will receive the prizes. There will be also selected 3 spare winners who will be involved in case one of the winners will be eliminated due to abuse of the rules. Sweepstakes is published in leaflets SSNZ and on the website http://www.slovenia-terme.si. Sweepstakes is intended only for natural persons, legal persons cannot participate in the Sweepstakes. The participant of the Sweepstakes can be any natural person who, in the period between March 21, 2015 and October 10, 2015 fills in the online form for participation in the Sweepstakes and answers correctly. By entering the email address the participant agrees with the terms of the Sweepstakes. Participants of the Sweepstakes can participate several times but can be selected only once. In case of abuse or attempted abuse of the Sweepstakes, the organizer of the Sweepstakes can exclude such participant from participation in the Sweepstakes, or can, in case the contestant has been selected, exclude him/her and therefore he/she is not entitled to the prize. The above mentioned does not exclude a possible civil or criminal responsibility of the participant due to abuse or attempted abuse. Only individuals who provide their email address and the correct answer will be included in the raffle. It is considered that by taking part in the competition participants consent to all the conditions relating the Sweepstakes, accept the rules of the Sweepstakes and agree with them. The raffle will be held at the headquarters of the organizer of the Sweepstakes, AV studio, Ltd., Koroška cesta 55, 3320 Velenje. The first raffle will take place on April 21, 2015, the second on May 21, 2015, the third on June 22, 2015 and the fourth on July 21, 2015. Rules of the Sweepstakes and the winners will be published on the website http://www.slovenia-terme.si/. Results of the raffle are final, complaints are not possible. The winners will be informed about the outcome of the raffle on the email address they entered in the form. The winner must communicate to the organizer his/her data: name, surname, address, date of birth and tax number. If the data is not communicated to the given date, the contestant is no longer entitled to the prize; in this case, the prize is awarded to the first spare winner. Skupnost slovenskih naravnih zdravilišč, EEIG is in charge for the claim of the prize and the contact with the winners. At least one member will be present at the raffle. All three persons present will be laid down in the minute of each raffle (at least one member of the Commission, two additional members). The organizer of the Sweepstakes AV studio, Ltd. undertakes to protect the submitted personal data in accordance to the Law on personal data protection, and to use them exclusively for the purpose of the Sweepstakes. At the end of the Sweepstakes, the organizer will forward the contestants database to the purchaser of the Sweepstakes Skupnost slovenskih naravnih zdravilišč, EEIG. With the sent email, the participant of the Sweepstakes gives personal consent that his/her data is used and processed by computer for the purposes of this Sweepstakes and other advertising in connection with novelties of the company Skupnost slovenskih naravnih zdravilišč, EEIG. AV studio, Ltd employees and their immediate family members are not allowed to participate in the Sweepstakes, as well as other natural or legal persons who in any way participate in the realization of the Sweepstakes. In case the winner is a person younger than 18 years of age, the winner must be represented by a person older than 18 years of age who has, according to the law and/or on the basis of an adequate authorization, the right to represent a minor. The organizer of the Sweepstakes reserves the right to cancel at any moment or amend the conditions of the Sweepstakes due to substantive, commercial, technical causes or force majeure. The rules are made binding on the organizer and other persons who are in any way associated with the event and the issue of the prize, as well as for the participants who by completing a data form acknowledge these rules and undertake to follow them. During the duration of the Sweepstakes, Terms and Conditions are published on the website www.slovenia-terme.si. The interpretation of individual articles of these rules is the sole responsibility of the Commission, who can, for individual opinions and other legal tasks, nominate and authorize an attorney. In case of disputes in connection with the raffle, court in Ljubljana shall have jurisdiction over the resolution of the dispute. The rules come into force on March 21, 2015. Copyright © 2015 SSNZ | Production AV studio d.o.o.